Manila, Philippines (Updated June 12) – The list of passers and related results for the secondary level of DepEd's ALS A&E test for School Year (SY) 2017-2018 conducted on March 2018 are expected to be released from June 11-15, 2018. The said examinations were administered by the Department of Education and Bureau of Education Assessment (BEA) at various testing centers around the country on March 2018. On this page, examinees can find the full list of results courtesy of the education department. Alternative Learning System (ALS) Accreditation and Equivalency Test (A&E) is a program of the Department of Education for dropout students, out-of-school youth, financially insufficient, working individuals and are not capable of finishing the elementary and secondary studies at formal schooling either in public and private schools. ALS uses modular approach of teaching. The students are not required to attend on daily basis, only during the agreed schedule between the teachers and students. Teaching are divided into 2 parts, one being done in school and the other in the community. Facilitators uses uniform learning modules covering all important academic subjects like Mathematics, Science, Filipino, English, etc. Just like graduates from formal schooling, ALS A&E finishers will also receive diploma duly signed by the education secretary which can be used for enrolling in Grade 11 and other related purposes. With DO 27, A&E Test-High School Level passers will now have more options after completing the program. They may choose to either, a) enroll in college/university as first year students (subject to admission policies and requirements of higher education institutions); or b) take skills development programs being offered by the Technical Education and Skills Development Authority (TESDA) and/or other accredited government and private skills training institutions. ALS A&E is a yearly examination program being administered by the Department of Education at all designated regional testing centers around the country. To pass the exams, examinees must obtain 60% rating. 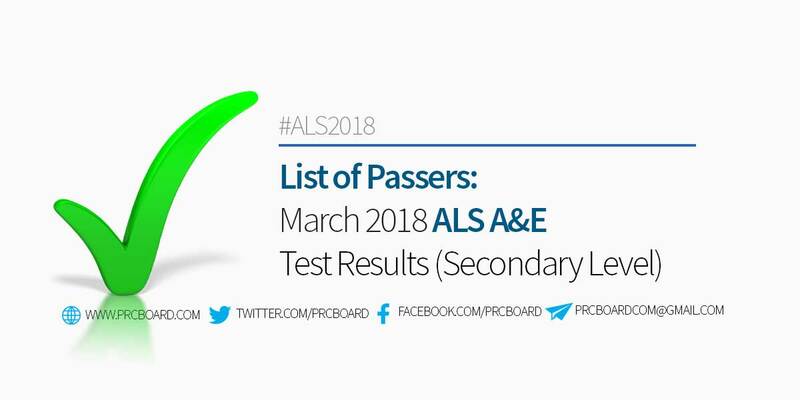 To receive up-to-date news on ALS Result for March 2018 for Elementary and Secondary levels, we advise our visitors to bookmark this page, visit DepEd official website, follow us at our social media pages via Facebook and Twitter or join the members discussions at our Facebook Group. san po makikita yung full result sa wxam ng march 2018? Anong oras kaya lalabas result? wala naman pong nalabas na result? meron po ba talaga? or another paasa na naman ito? Good evening ! Just to ask ! When is exact date to release the ALS examine result for the 2017-2018 ? kailan po ba Talaga lalabas ang result? Kase po some of students ay mahihirapang pumasok kase some of schools are officially opened. Paano na po ba yan po? wagna kayong umasa walang lalabas na result hahaha! Sge pa po. Paasahin nyo pa po kami ng sobra sobra. Salamat po for always giving us more hopeless feelings. Rip grammar dba? Kaya nga po gusto sana mag aral para mtutu kaso gnto lang lgi paasa. Nyare sa pinas june 12 na ?? A while ago, some of my teachers said that the result will not passed until June 11, but it's already June 12 now... They don't have a calender eh? Sana mailabas na po ang result nang hindi na kabahan yung kapatid ko. Sa lahat ng mga taga DepEd ALS, bakit po ba sobrang tagal nyo maglabas ng result ng exam sa tuwing taon ganyan palagi? Ang nasasakripisyo ay mga estudyanteng asang-asa na makakapag enroll na sila sa Grade 11. Tapos ang masama nito kung kelan nyo ilalabas saka naman wala ng enrollment para sa kanila kasi tapos na. Matawagan naman sana kayo ng pansin sa ganyang sistema nyo! Hindi yan nakakatulong lalong pahirap sa mga estudyante. Dapat siguro nakakarating 'yan sa kaalaman ng Office of the President para makastigo ang mga nagpapabaya sa tungkulin nila. Wait patiently and pray unceasingly! May God bless the result! How did you know? Wala pang result, right? Ang tagal naman sabi nila 11-15 pero ngayon wala na.. BAT WALA PARIN ANG RESULTA ..ANONG PETSA NA NGAYON 17 NA NG HUNYO BAT BWALA PARIN??? JUNE 19 WALA PA DIN PO BA ? Anong petsa na. Bakit wala pa? Puntahan nyo teacher nyo, sa kanila kayo magtanong kung nakapasa kayo. Nasa kanila ang results. 21th of june na, anuna? may balak pa po ba kayo irelease yung results? ang daming umaasa at hoping na makapag enroll na for this s.y pakibilisan naman mga beshy huhu or sabihin niyo nalang kung kailan exact date para di kami asa ng asa. kapag may tiyaga, may nilaga! antay antay lang poh kau..
ko si Liza Acevedo kumuha po ako ng exam noong march sa Madrid, Surigao de sur ang mga classmate ko san nasa grade 11 na ngunit ako walang resulta nasa 9th year pa rin dahil walang result na pinadala sa akin.